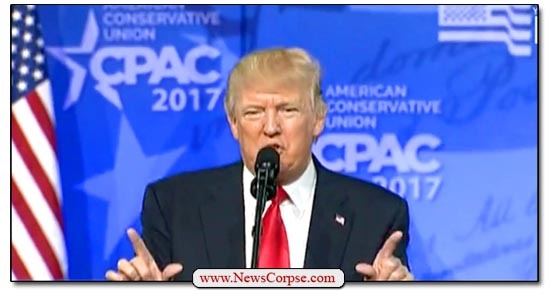 It’s time once again for the annual Conservative Political Action Conference (CPAC) put on by the American Conservative Union. This affair is a four day circle jerk of right-wingers wallowing in their muddy pit of country club white nationalism. And this year the roster of speakers has a particularly notable stench of political devotion that borders on religious idolatry. And that’s not all. There are several other people that will be familiar to Trump’s followers and Fox News viewers. People like “sheriff” David Clarke, John Bolton, James O’Keefe, and the GOP chair of the House Intelligence Committee (and future felon), Devin Nunes. Also, Wayne LaPierre of the NRA, whose name was omitted from the speakers list because he’s toxic. And let’s not forget Marion Le Pen, the leader of France’s neo-Nazi party. Trump has been having a horrible week. He has had to deal with a top aide who was accused of wife-beating. He has exhibited his inability to respond like a human being to the tragedy in Parkland, Florida. He unleashed a torrent of tweets exposing how frightened he is about the tsunami of political and legal jeopardy he faces. So he is undoubtedly looking forward to his appearance at CPAC. It’s an opportunity to get in front of an adoring crowd and pontificate incoherently for an hour and be applauded for it. The audience will cheer wildly as Trump lashes out at their favorite enemies – liberals, democrats, minorities and, of course, the media. They’ll rise to their feet whenever he utters a word about a wall or a former “crooked” opponent. And Trump will get his fix of adulation from his glassy-eyed disciples before he has to return the “dump” on Pennsylvania Avenue and lay in bed worrying about when special counsel Robert Mueller’s hammer will come down. Once again, Donald Trump is caught convening with his “outhouse” cabinet (too crappy to be in the kitchen) on Fox News rather than knowledgeable professionals. 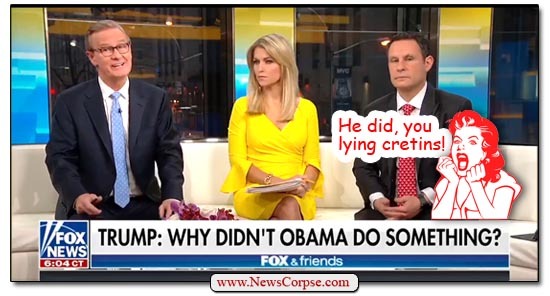 The “Curvy Couch” potatoes of Fox and Friends delivered another of their “Presidential Daily Briefings” to the only person in their audience that matters to them. Thank you to @foxandfriends for the great timeline on all of the failures the Obama Administration had against Russia, including Crimea, Syria and so much more. We are now starting to win again! “There is no serious person out there who would suggest somehow that you could even rig America’s elections, there’s no evidence that that has happened in the past or that it will happen this time, and so I’d invite Mr. Trump to stop whining and make his case to get votes.” …..
First of all, there is plenty of evidence of Trump’s collusion, starting with Donnie Jr.’s meetings with Russians (which he initially lied about) in Trump Tower. There are verified connections between Trump, Wikileaks, and Russia, who Trump begged to hack Clinton and release the stolen emails. There are more than a dozen Trump associates who met with Russians and lied about it. And no one knows what further evidence special counsel Robert Mueller has that won’t be disclosed until he concludes the investigation. What’s more, Doocy’s deliberate disinformation about Mueller’s indictments misstates the facts. It wasn’t a hundred thousands dollars and a few Facebook ads. It was over a million dollars a month and thousands of Facebook and other Internet posts seen by millions of Americans. More importantly, Trump appears to be conceding now that the election interference did occur. And while he’s obsessing over Obama’s response, he’s ignoring that he has done nothing himself. To the contrary, he is letting his pal Vladimir Putin off the hook. Trump refuses to impose sanctions that were voted on nearly unanimously by Congress. And although he will criticize everyone from Obama to Clinton to Oprah, he has never said a cross word to or about Putin. No matter what Trump thinks of Obama, he has a responsibility as the current president to protect and defend the country. But he’s never even had a cabinet level meeting on the threat of Russia’s election tampering. Nor has he directed his intelligence and law enforcement agencies to address the matter. If he thinks that Obama was negligent, then what is he saying about himself? It’s almost as if he’s happy with Russia’s political intrusions and wants them to continue. Or maybe that they have something on him that is costly to his financial empire or personally embarrassing. Nah – couldn’t be any of that. Could it?